This is an era of 4K. In recent years, 4K related news come up constantly. YouTube, as a popular video streaming website, also wants to keep pace with times bringing viewers new video streaming experience. In 2014, YouTube tested both 60fps and 4K videos separately, and quickly in March 2015 YouTube tested a handful of 4K videos at 60 frames per second. 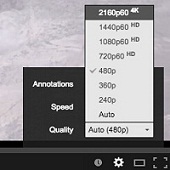 When we choose 4K 2160p 60fps option from the YouTube gear icon, we can get sharper video. What's more, it is obvious that the movement appears far smoother than at more common frame rates of 24fps and 30fps. So in this post, you will be leaded to learn the requirements of watching 4K@60fps videos online on YouTube as well as how to free download 4K 60fps videos, GoPro or DJI drone 4K videos or 4K movies for example, for offline use. To watch YouTube 4K 60fps videos in all their glory, firstly you need to have a computer with a display capable of managing 3840×2160 (4K) resolution and a GPU powerful enough to export at that detail at 60 frames per second. In addition, you need extremely fast internet connection to ensure smooth 4K 60fps video streaming. But if your network is slow, you'd better download the 4K 60fps videos from YouTube for offline playback fluently. WinX YouTube Downloader can free download 4K HDR videos movies at 60fps with ease. 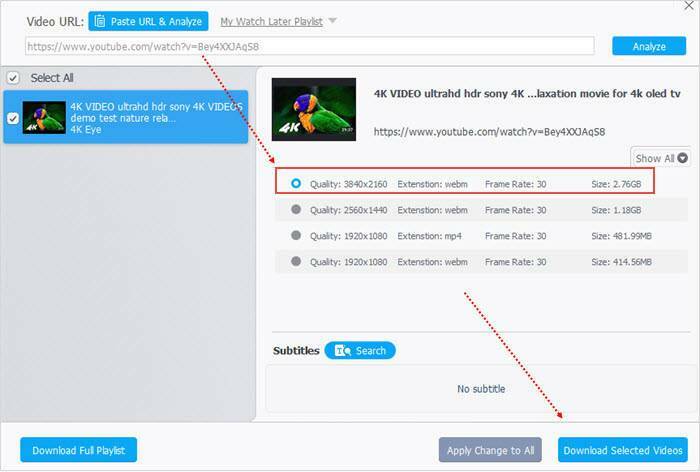 Moreover, it can download SD/720P/1080P/1440P HD/4K/8K/3D movies, TV shows, songs and more from YouTube, Dailymotion, Metacafe, Vimeo, and other 300+ sites easily. 100% clean and safe. Less bandwidth required and fast downloading speed. How to Free Download 4K 60fps Video from YouTube? It is known to all, YouTube doesn't come with a download option. If we want to download YouTube videos, including those 4K videos at 60 frames per second, we need to have a third-party YouTube video downloader installed on our computer. YouTube downloaders are easy to find in the market, while a 4K@60fps video downloader is rare. But you don't need to head to the web and struggle to dig out the downloader for 4K 60fps video download, because a powerful clean yet free 4K 60fps downloader will be introduced here, namely, WinX YouTube Downloader. By test, WinX YouTube Downloader can free download 4K 2160p UHD videos at 60fps from YouTube quickly without quality loss, thanks to the built-in High Quality Engine, Multicast and Multi-thread Technologies. Besides, it can also be applied to download 8K videos movies at 60fps, 1080p, 720p HD at 120fps/60fps/30fps and SD videos from Dailymotion, YouTube, Vimeo and other 300+ video sites. As a 100% clean program, it will not bring you any adware, spyware, malware, virus and the like. First of all, download 4K 40fps video downloader on your PC. And then install and launch it. When it is ready, just run this tool as the steps below. 1. Click the +link button on the downloader to get into a new panel where you are asked to insert the URL of target 4K 60fps video. You can use search term "4K 60fps" to find some 4K 60fps sample videos/gameplay/walkthrough/GoPro action camera/DJI drone videos. 2. Tap Analyze button to fast load the video title, duration and available output options. To download 4K ultra HD videos at 60fps videos, please choose the output with 3840 x 2160 resolution and then hit Ok to move on. If 4K 60fps is too big for you, converting 4K 60fps to 4K 30fps to compress video file size would be a good option. 3. If you want to download multiple 60fps 4K videos at one go, simply repeat the first two steps before any further. If not, just hit Download button to start downloading 60fps 4K videos from YouTube. Need to convert/compress 4K 60fps videos to 1080p/720p 60/30fps MP4, AVI, WMV, MOV, MKV, HEVC, MP3, iPhone, iPad, Samsung, HTC, Sony, Windows Phone, or other formats or devices, just try hardware-accelerated WinX HD Video Converter Deluxe. It can not only convert/compress 4K UHD videos at 60fps, but also free download 4K 60FPS videos from YouTube and other sites. Why Hardware Acceleration Is Essential for 4K Video Processing? 4K videos come with massive data. If no hardware acceleration, we have to face ultra-high CPU usage, high temperature, dramatically slow processing speed, and even fail to handle high bitrate 4K videos. Considering of that, Digiarty Software revamped WinX HD Video Converter Deluxe taking the lead in supporting level-3 hardware acceleration powered by Intel QSV and NVIDIA CUDA/NVENC. Level-3 is the highest level utilizing hardware accelerator across decoding, encoding and processing. Thereafter, it can guarantee smooth 4K video processing and improve speed maximally while providing highest possible video quality.